The Museo del Prado is marking the publication of the catalogue of its sixteenth-century Italian drawings by simultaneously presenting the exhibition A Century of Italian Drawings in the Museo del Prado. From Michelangelo to Annibale Carracci. 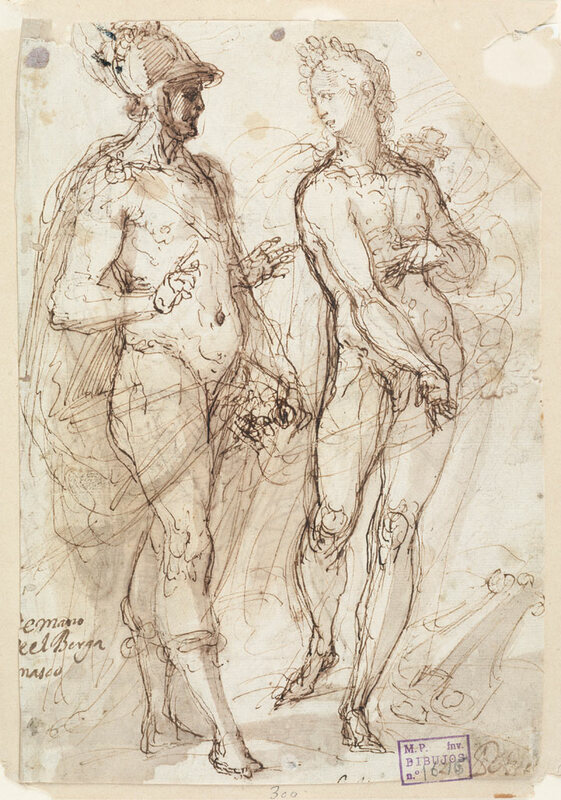 With this exhibition, sponsored by the Fundación Winterthur, who are also sponsoring the catalogue, the Museum will be exhibiting many drawings previously unknown even to specialists, including two small sketches by Michelangelo for the Last Judgement in the Sistine Chapel that have been recently attributed to the artist. Focusing on the period from Mannerism to the early Baroque (1520-1620), the exhibition features a group of 70 Italian drawings, almost all from the bequest of the collector, Pedro Fernández Durán, an important legacy which entered the Prado in 1931. The Museum's collection of Italian drawings is a practically unstudied area, which despite the interest of a number of international specialists over the years lacked even a published inventory detailing all of its contents. The new catalogue that accompanies the present exhibition thus represents a major advance in the study of the history of this part of the collection. Most of the drawings have not previously been published and have never been displayed to the public since the time that most of them arrived at the Museum from the bequest of Pedro Fernández Durán. Recent investigation into some of these drawings, particularly the Italian sixteenth-century sheets which make up most of the exhibition, resulted in an extraordinary discovery. These were the two drawings by Michelangelo for the Sistine Chapel (Study of an Arm and Study of a Shoulder) previously considered to be works by his school, but now firmly attributed to his hand. In addition, other discoveries of outstanding works including the Study for a Female Figure by Andrea del Sarto and Judith with her Maid by Polidoro de Caravaggio. All these are the result of the painstaking scholarly research carried out by the Renaissance and Baroque drawings specialist, Nicholas Turner in preparation for the catalogue. Aside from these new discoveries, the exhibition also offers a unique opportunity to see remarkable examples of works on paper - many for the first time - by artists as significant as Andrea del Sarto, Luca Cambiaso, Palma Giovane, Giulio Romano, Polidoro da Caravaggio, "Il Bergamasco", Parmigianino, Giorgio Vasari and Annibale Carracci, among others. 1567 - 1572. Wash on paper, 264 x 214 mm. The sixteenth century was a key period for the development of drawing in Europe. 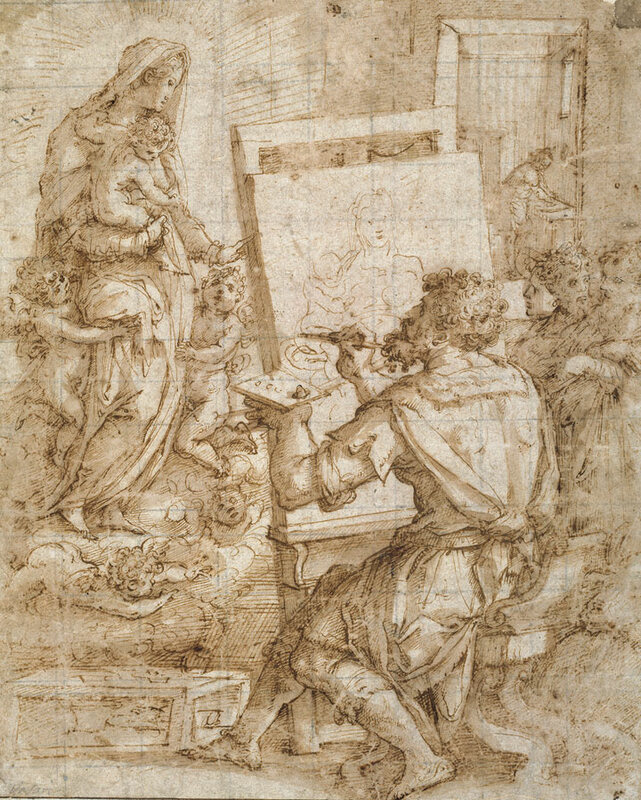 The wide range of drawing types, the variety of regional and individual styles and the importance which artists gave to this medium meant that this was a particularly important time for the development of the technique. Painters learned that drawing was not just a practical exercise for the purposes of study, but that it allowed them great freedom to express their imagination and individual artistic personality. The present exhibition features a selection of seventy drawings, all of which entered the Museum as part of the bequest of the collector, Pedro Fernández Durán (1846-1930). Together they offer an overview of the variety and techniques of Italian sixteenth-century drawings. The bequest, which came to the Museum in 1931, is the core of the Prado's collection of drawings, along with those originally in the Spanish royal collection. The exhibition aims to explain the intrinsic importance of the medium of drawing, as well as the way in which it was used by artists. Along with highly finished works which were used as modelli for paintings, it also includes rapid compositional sketches, primi pensieri ('first thoughts'), and figure studies of a greater or lesser degree of finish. The organization of the exhibition reflects this variety of types and artists, with the drawings grouped by geographical regions, allowing for an appreciation of the different characteristics of each. The exhibition opens with Florentine drawings, including the magnificent Study for a Female Figure with Drapery by Andrea del Sarto (1486-1530) and Saint Luke painting the Virgin by GiorgioVasari (1511-1575). It continues with a group of artists who were mainly active in Rome, led by Federico Zuccaro (1540/1-1609) with his Dignitary kneeling before the Pope to receive a Chain and other Honours. 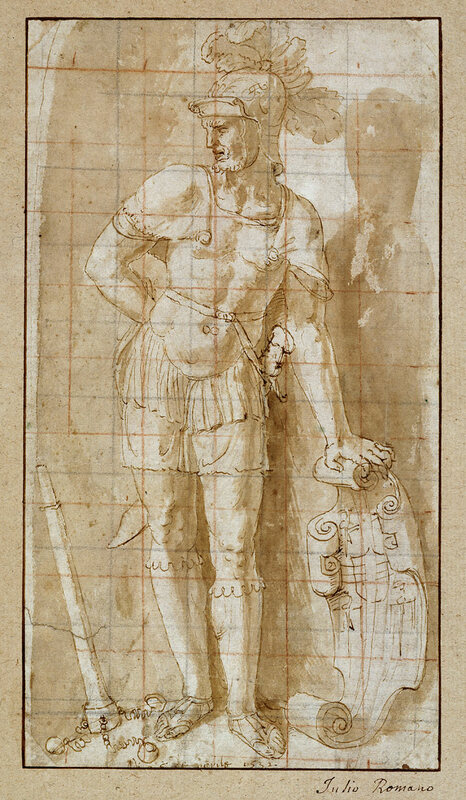 Next come Genoese drawings, notably the work of Luca Cambiaso (1527-1585), in particular his Hercules shooting with a Bow, as well as Giovanni Battista Castello (1509-1569) known as "Il Bergamasco", represented by the brilliant, rapidly-executed Mars and Apollo. Alongside these sheets is one of the key works in the exhibition, the Project for a Mural Decoration by Annibale Carracci (1560-1609). The exhibition then focuses on the figure of Michelangelo. Two figure studies by the artist for the Last Judgement in the Sistine Chapel have recently been identified in the Prado's collection. Displayed nearby are works by the followers of Raphael: Giulio Romano, Perino del Vaga and Polidoro da Caravaggio. These drawings offer the opportunity to fully appreciate the mastery of drawing, with their perfect grasp of anatomy, movement and the effects of light on form. There follows a further selection of Genoese drawings, together with a group of works by artists from northern Italy. Among these, the Venetian school was par-ticularly important, characterised by its luminosity and compositional inventiveness. 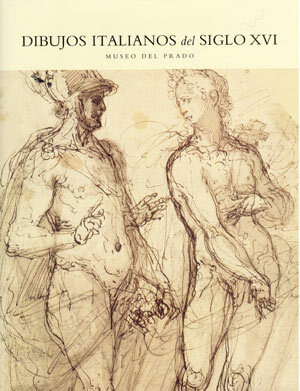 The exhibition is accompanied by the publication of Volume V of the catalogue of drawings in the Museo del Prado. It covers the sixteenth-century Italian drawings in the collection and is written by the Renaissance and Baroque drawings specialist, Nicholas Turner. XVI Century. Wash on paper, 231 x 128 mm. Among its holdings, the Museo del Prado has a notable collection of sixteenth-century Italian drawings. Almost all of these came from the Fernández Durán bequest, which entered the Museum in 1931. The drawings were mainly acquired in Paris in the late nineteenth century, although some came from the Italian art market. The importance of this bequest was recently highlighted when a small but fine group of works was featured in the exhibition Seventeenth-century Bolognese Drawings held at the Museo del Prado. Pedro Fernández Durán assembled a remarkable collection of drawings from old European collections built up in the seventeenth to nineteenth centuries. The sixteenth-century Italian drawings from this bequest are practically unknown as they have never previously been studied as a group. Only around a dozen sheets have been previously been published and as a result, the present project has resulted in the re-attribution of many of these works and no small number of surprising discoveries. Pedro Fernández Durán y Bernaldo de Quirós (1846-1930) should be included among the leading benefactors of the Museo del Prado, given the importance of his Bequest. In addition to his drawings, he had a highly important collection of paintings, including five works by Goya. Together with the sheets from the Spanish royal collection, the drawings form the core of the Prado's drawings collection. In addition to the Italian works, the Fernández Durán bequest also contained drawings by Goya as well as a notable group of decorative works of art and tapestries. 1566 - 1569. Wash on paper, 255 x 173 mm. Drawing is undoubtedly the most immediate and spontaneous expression of the artist's creative powers. From the Renaissance to the present, artists have used drawings to set down their first ideas for finished works in whatever medium, be it painting, sculpture, architecture or print. Putting down the initial idea on a sheet of paper is the most direct mode of artistic expression, revealing the artist in the purest state of creativity, free from material constraints. In drawings, line and shape are the basic medium of the creative genius. As we find ourselves ever more capable of appreciating the work of the great artists, so our desire to understand the creative process that lies behind their major works increases. This is also true for those smaller, more intimate works which artists made for themselves or their friends and which reveal an essential desire to express their creative impulse. As a consequence, in the present day the drawing has become increasingly highly valued, not just as a documentary record of artistic creation but also as an at times independent work which allows us to better grasp the essence of the creative genius in its most personal aspects. For some years now, the number of temporary exhibitions devoted to drawings in Spain has been rising. This has provided the public with an opportunity to appreciate hidden treasures which are only rarely on view due to the conservation requirements arising from the fragility of the paper and inks, both are which are particularly sensitive to light.